We shall now look at his svarUpa guNas (qualities of his svarUpam. Just as the qualities of his rUpam (physical body) are like decorative jewels for his rUpam, the qualities of his svarUpam are also like jewels for his svarUpam. svAbhAvika – natural; just as the nature of water is being cold to touch, for bhagavAn these qualities (mentioned later) are natural. anavadhikAthiSaya – qualities are without boundary, and are wondrous. Initially SrI rAmAnuja talks about the six basic qualities of bhagavAn, starting with gyAna bala …. gyAna – ability to see past, present and future events at the same time, as if they are happening in front of the eyes. vIrya – Even when he sustains all beings during pralayam (deluge) or when he creates the entire universe at the start of new series of yugas, he does not even raise his eyebrows nor a drop of sweat falls off his thirumEni (body). There is no change in his demeanour. Sakthi – Enabling jIvAthmAs to carry out their tasks as per their karma (past deeds) is his Sakthi (energy). Ability to bind things which cannot be bound together is also termed as his Sakthi. He is also the raw material for creation of universe and this is also termed as his Sakthi. thEjas – He has the ability to conquer anyone. This quality is known as thEjas. For the sake of his ASrithars (those who surrender to him) he displays many qualities. A few of these are listed by SrI rAmAnuja here. sauSeelya – not seeing the difference between superior and inferior persons is sauSeelyam. In the case of bhagavAn, he does not even think about his superiority. The ease with which he became friends with a hunter tribal head, guha, or monkey tribal head, sugrIva, or a rAkshasa, vibhIshaNa (not only friends, but going beyond, by calling them as his brothers), or treating cowherds as his close friends, are all examples of his sauSeelyam. vAthsalya – the affection that a cow shows towards its calf that it gave birth to on that day, by licking clean all the dirt on the calf’s body with its tongue. In the case of bhagavAn, he treats the fault in his ASrithar (one who surrenders) as a good quality. mArdhava – very soft, in his heart. Softness in the body is saukumArya that we had seen earlier. Here it is softness in the heart. He is unable to bear the separation from his ASrithar due to this quality. Arjava – when he is together with his ASrithar, his mind, word and act become one and he gives up himself to his ASrithar. Another term to describe this quality is honesty. sauhArthdha – good at heart. Thinking good for everyone. sAmya – Being equal to everyone irrespective of the jIvAthmA‘s birth or qualities. He treated guha and sabari equally, without any distinction. kAruNya – If someone is in distress, going out to help him, without expecting any benefit for self, is kAruNya. mAdhurya – Even if someone were to take a knife out to kill bhagavAn, the person drops the knife because of the affection in his eyes. gAmbhIrya – very deep; if he wants to do something good to his ASrithars, they will not know what he will do and how much. He does not consider the greatness of his ability to gift and the lowliness of the person who takes from him. oudhArya – Gifting quality, being very generous. Even without his ASrithars asking for it, he gives it. And he does not count how much he has given. There is a subtle difference between this quality and the previous quality, gAmbhirya. oudhArya is the quality that makes him give while gAmbhIrya is the quality by which the person who receives it will not know what he will give and how much he will give. chAthurya – being so clever that even his pirAtti [consort] will not know about the fault in the ASrithar. He removes the doubts in the minds of the ASrithars whether he would protect them and protects them. 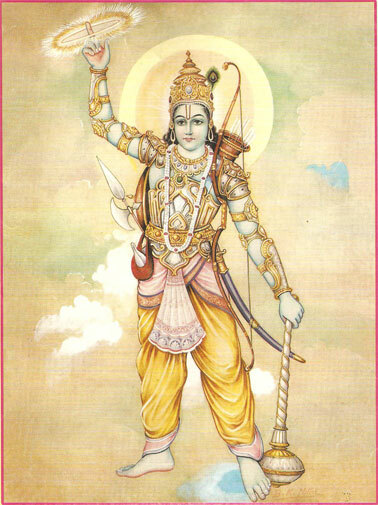 For example, when sugrIva had doubts about SrI rAma‘s ability in taking on vAli, he asked him to prove his valour to his satisfaction, and Rama did that. sthairya – once he decides that he will protect his ASrithars, even if millions of enemies come to fight with him, he will not sway from his proclamation. He stands firmly by his decision. dhairya – The courage in his heart to stand by the previous quality. Saurya – ability to destroy the enemies of his ASrithars. parAkrama – Not becoming tired even in the face of tackling millions of enemies. sathyakAma – possessing those qualities that ASrithars desire to see in him. These are his auspicious qualities and immeasurable wealth. sathyasankalpa – Ability to create anything that will not go waste through his sankalpam (will). These two qualities are part of the protective qualities that he possesses (when he creates, protects and destroys). kruthithva – If his ASrithar gets what he desires, bhagavAn feels that he himself has attained it. He is that happy. kruthagyathA – Once the ASrithar surrenders to him, he forgets all the sins committed by the ASrithar and thinks of only the act of surrendering. Even after he gives everything to the ASrithar, he remembers the good acts of the ASrithar and thinks of what more he can give. And if by chance bhagavAn commits an error towards his ASrithar, he keeps thinking of this all the time (such as when he refused bharathans request to return to kingdom from forest in rAmAvathAram). Adhi – Many more such qualities are there in him, apart from what has been mentioned already. asankhyEya – Countless such qualities. kalyANa – Whatever he has, they are all only auspicious. guNa gaNougha – These qualities are present in large quantities and in large groups. Anger in us would be taken as a bad quality. But in his case if he gets angry with his ASrithar, even that is considered as a good quality as it is meant to correct the ASrithar. mahArNava – These qualities are like a great ocean. Even if we were to be granted the four faces of brahmA, we can not complete listing all the auspicious qualities that he has. Next SrI rAmAnuja talks about his ornaments and his weapons. svOchitha – suited to him. For someone having all the qualities listed above (bhagavAn), SrI rAmAnuja now lists the ornaments. Just as gyAna, bala, aiSwarya etc add beauty to his svarUpam, he lists the qualities of the ornaments that add beauty to his thirumEni (form). vividha – These ornaments are of different types. Made of pearls or coral or other gems. anantha AScharya – making us wonder endlessly. While he is wearing many different ornaments made of different gems, we are not able to grasp fully, the beauty of any of them. They are all so wonderful. If we look at his diamond chain, our eyes will not be able to leave that and go to his ear rings. Even if we look at the ear rings, we would not be able to fully grasp the beauty of either chain or ear rings. nithya niravadhya – These jewels are without the fault of either growing or diminishing. They will be constantly glowing. Also, being sentient in nature (unlike the jewels that we wear), these ornaments are not there for themselves but for the sake of bhagavAn. nirathiSaya sugandha – His ornaments will also be sweet smelling. We may wonder as to how ornaments will emit smell. Since bhagavAn‘s thirumENi (body) itself is sweet smelling, the ornaments will also get the sweet smell. Decorating him with flowers further is not for emitting sweet smell but for the sake of adding to the overall beauty. nirathiSaya sukasparSa – These ornaments will not cause any irritation to bhagavAn but would be very soft on his thirumEni. There will be no need to remove them even when he goes to sleep. nirathiSaya oujjwalya – His thirumEni itself emits radiance. These ornaments will even suppress his thirumEni’s radiance, such is their brilliance. Until now SrI rAmAnuja was describing the qualities of the ornaments. Now he lists these ornaments, starting with kirIta on his head and ending with nUpur on his ankle. kirIta – kirItam is the ornament worn around his head, just above the forehead. makuta – makutam is the crown that is placed over the kirItam. chUda – chUdam is the ornament worn from the central portion of his hair, hanging onto the forehead. avathamsa – ornament worn over the ear, covering the entire ear. makara kuNdala – ear studs in the shape of fish. graivEyaka – circular ornament worn around the neck. hAra – chain adorning the chest. kEyUra – ornament worn on the shoulder. kataka – bangles worn on the forearm. SrIvathsa – this is not strictly an ornament, but a bunch of hair, on a mole. It also acts as the seat for pirAtti when she sits on his chest. Unlike other ornaments which can be removed, SrIvathsam is a part of his thirumEni and is inseparable from him. kausthuba – a central chain on the chest, with five gemstones, worn on the chest. This is representative of all jIvAthmAs. mukthAdhAma – Chains made of pearl, with single or three or five strings. udhara bhandhana – ornament worn on the part between waist and stomach. During the time of pralayam (deluge) he provides his stomach as the abode for entire universe for safekeeping. This ornament is like an award for such a great action. It is also taken as a gift for his stealing butter and curd from neighbours. Thus the same ornament serves to highlight his being the swAmy (one who owns everything) and his being a saulabhyan (person who is easy to approach and being simple). pIthAmbara – yellow coloured dress, worn to highlight his being the sarvEsvaran (the lord of all sentient and insentient beings), looking as if his waist has blossomed. kAnchIguNa – Thread worn over pIthAmbaram to keept it in place, on his waist. nUpur – anklet. Adorns the thiruvadi (bhagavAn‘s divine feet) which serves as the abode sought after by his ASrithars (those who seek refuge under him). Adhi – Many more such ornaments, similar to the above. SrI rAmAnuja is unable to list all the ornaments that bhagavAn adorns and so says, “Adhi”. aparimitha – Not countable. There is no count for the number of ornaments that he wears. dhivya bhUshaNa – divine ornaments. There is a congruence between various part of his divine body and the ornaments that he wears over these parts. Next SrI rAmAnuja describes his divine weapons. svAnurUpa – suited to his rUpam (physical appearance). His weapons will look like ornaments to his followers while they will look like killing weapons to his enemies. achinthya Sakthi – the Sakthi (power) of his weapons is beyond our imagination. Sanka chakra gadhA SArnga – these stand for all five of his major weapons. Sanka is his conch, chakra is the discus, gadhA is his mace and SArnga is his bow. These will also represent his sword, called as asi. Adhi – Many more weapons like this. asankhyEya – countless. Just as his ornaments are countless, so are his weapons. SrI vEdhAnthAchAryar compiled a slOkA about 16 of his weapons. nithya – permanent, without growing or diminishing characteristics. niravadhya – without any fault. What fault can be there in weapons? These divine weapons, unlike the common weapons that we know of, will appear on bhagavAn‘s thirumEni as soon as he thinks of them. When they go to kill an enemy, they do not think that they have killed the enemy, but being a part of bhagavAn, they had carried out their role. nithya niravadhya also means that with passage of time, without getting blunt, they get sharper and sharper each time that they are used to kill enemies. nirathiSaya kalyANa – due to association with bhagavAn, they become auspicious in nature. They are also wondrous because even before bhagavAn lets them go, they complete their task of killing enemies. Mere thought from bhagavAn (sankalpam) is enough to activate them. dhivyAyudha – They are not composed of the five elements that we know of, but are aprAkrutham (not composed of cosmic matter) in nature. guNagaNa – having hordes of such qualities. We shall now see in detail the meanings of a few words in this chUrNai which were not mentioned earlier. SrIvallabha – Loving towards SrI dhEvi (mahAlakshmi). Madly in love with pirAtti. Husband of pirAtti who has such superior qualities, as listed above. Just as a person who has starved for long would look longingly at food, bhagavAn also looks at pirAtti with such love. Evam bhUtha – possessing similar superior qualities as listed earlier. bhUmi neeLA nAyaka – bhUmi pirAtti and neeLA pirAtti; though they are mentioned separately, they are treated on a par with mahAlakshmi in terms of their svarUpam and rUpam. Here, bhagavAn is mentioned as nAyaka whereas in the case of pirAtti, he is mentioned as vallabha. The difference is that a nAyaka (or lord) is one who expects his rights to be observed and goes by rules and regulations while a vallabha (loving person) is one who does things out of love and affection. It is said that bhUmi dhEvi and neeLA dhEvi had agreed to be servitors to bhagavAn and pirAtti and are contented doing service to them. Next SrI rAmAnuja goes on to look at the nithyasUris in SrIvaikuNtam. nithyasUris are those who were always present in SrIvaikuNtam and were never born in leelA vibhUthi (earth). Adhi SEshan, vishvaksEnar, garudan are all part of the group of nithyasUris. We shall see this in the next part of 5th chUrNai (part III). This entry was posted in gadhya thrayam, Other, SaraNAgathi gadhyam on December 16, 2015 by T N Krishnan.